According to the Korea Advanced Institute of Science and Technology (KAIST), complete with substrate, an active matrix for a flexible display need only be 4μm thick. Initially on a sacrificial laser-reactive substrate the matrix of ultra-thin n-type transparent oxide thin-film transistors (TFTs) were fabricated for the back plane. Laser irradiation from the backside of the substrate split off only the oxide TFT array as a result of reaction with the laser-reactive layer. 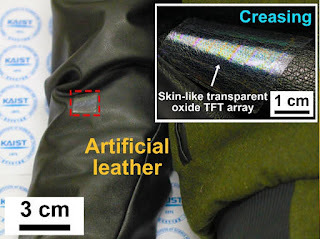 The free transistors were transferred to a 4μm polyethylene terephthalate (PET) substrate, and then the combination was further transferred con-formally to the surface of human skin and artificial leather to demonstrate the possibility of the wearable application. “The attached oxide TFTs showed high optical transparency of 83% and 40cm2/Vs even under several cycles of severe bending tests,” said KAIST. The method is called inorganic-based laser lift-off (ILLO). “By using our ILLO process, the technological barriers for high performance transparent flexible displays have been overcome at a relatively low cost by removing expensive polyimide substrates. Moreover, the high-quality oxide semiconductor can be easily transferred onto skin-like, or any flexible, substrate for wearable application,” said Professor Keon Jae Lee. Con-formal displays are a potential application.